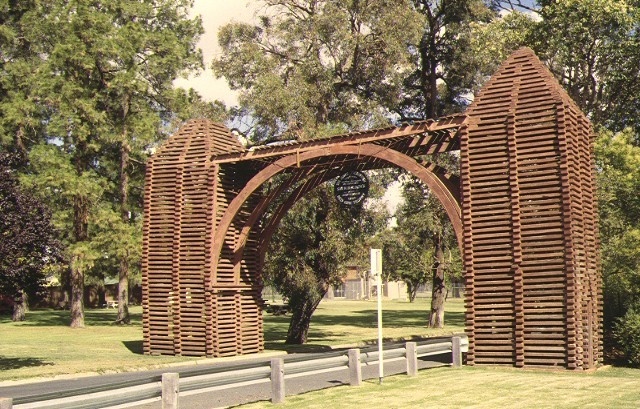 The Red Gum Memorial Archway was originally erected in High Street, Echuca, opposite the Mechanics Institute in September 1884, for the visit of the Colonial Governor, Sir Henry Brougham Loch. It was manufactured by James Mackintosh's Echuca and Moama Redgum Sawmill Company, which also paid for the arch. Shortly after the Governor's visit, it was relocated to its present position at the entrance to Victoria Park, with alterations being made to increase its stability. The Red Gum Memorial Archway consists of two pylons which are roughly square in plan and have pyramidal tops. 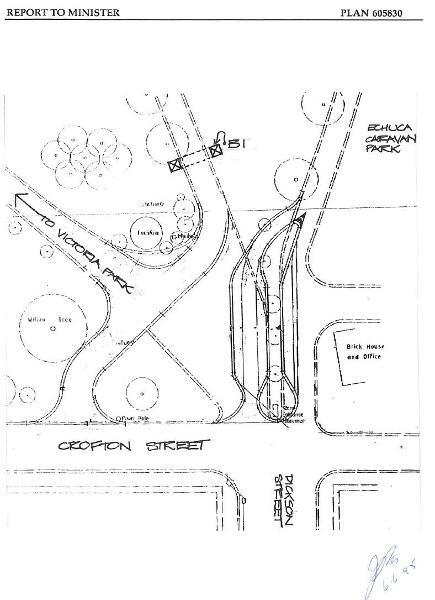 They are linked by a curved arch. The pylons are formed from ex 5"x3" redgum planks overlapping at the corner and spaced vertically so that there is a gap between each plank. The pylons are reinforced with iron rods. The archway is formed from three curved and built up redgum beams secured with plates and tied together with rods. 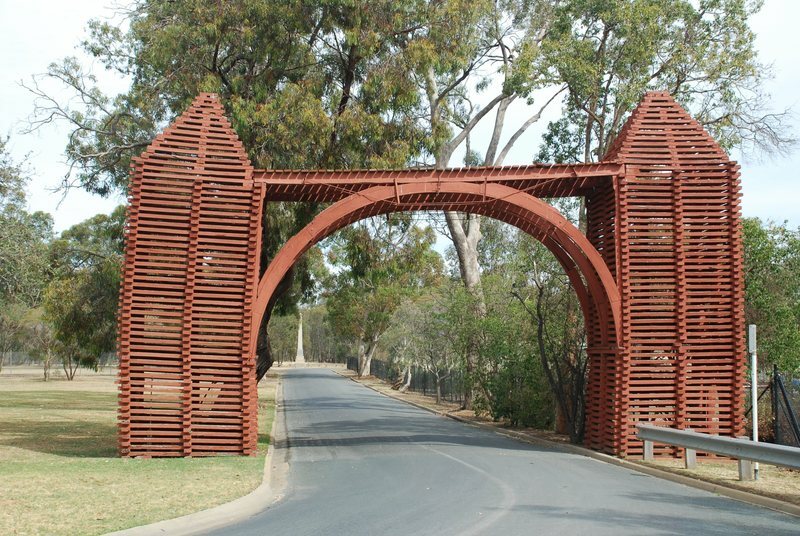 The Red Gum Memorial Archway is historically, aesthetically and architecturally important. The Red Gum Memorial Archway is the only known surviving example in Victoria of a 19th century memorial which as originally constructed as a temporary processional or ceremonial arch but which was subsequently transformed into a permanent structure. It symbolises the importance of the local redgum industry in Echuca, which supplied piles used in the construction of wharves in Geelong and Williamstown, sleepers for the railways, and export timber for use in India and other British colonies. The Red Gum Memorial is a tangible reminder of the redgum pioneer, James Mackintosh, and his Echuca and Moama Redgum Sawmill Company which was once responsible for the employment of over 500 people. He was a prominent local citizen, being a Borough Councillor and Mayor, and an elder of the Presbyterian Church. The Red Gum Memorial Archway also demonstrates unusual decorative use of redgum. Redgum Memorial Archway, Victoria Park, Crofton Street, Echuca, Shire of Campaspe. 1. All of the building marked B-1 on Plan 605830 endorsed by the Chair, Historic Buildings Council and held by the Director, Historic Buildings Council. Erected in 1884 by James Mackintosh, owner of the local sawmill, for the visit of the Governor Sir H B Loch, this is the only known example in Victoria of a nineteenth century ceremonial arch, a type usually intended to be temporary.